I’ve used adding machine tape regularly in my crumbs quilts. I have two main sizes - one is about 2” wide and one is about 4” wide. I found the 4” wide at a store in Newton, KS but I think I saw some on Ebay in the USA. I’m going to show you a series of pictures that will show you on the wider tape. I actually find the skinnier tape easier to sew on because I can use smaller pieces. Start sewing your pieces on the paper. Use the same method as for making string blocks. Add another piece to the the piece just to the left. I do not iron but just smooth it out with my hands. Sometimes a little bit bigger seam allowances are necessary. I sometimes add shaped pieces - not necessarily strips. I opened out the piece that isn't a simple strip. Because of where it is, I will sew it down to the paper without sewing a strip on it just to hold it in place. Sew another strip along the edge of the now almost horizontal piece. This provides interest to the strip of strings/crumbs. Now I'm adding a whole section of previously made strings blocks - the trimmings. Flip it over and take a look. Add another strip and make the seam allowances big enough to catch the uneven places underneath. By now the angle is almost straightened back out. Turn it over and sew next to the edge of the paper. Sew next to the edge of the other side as well. You can see that both edges are sewn. Trim (I use scissors) next to the paper. If you want and think it is easier, you can use your rotary cutter. Overall shot - you can see the variety of colors and shapes. I like to see variation in angles in my paper tape of scraps. When I am done, I roll it back up and keep going til the roll is finished. And now you know. 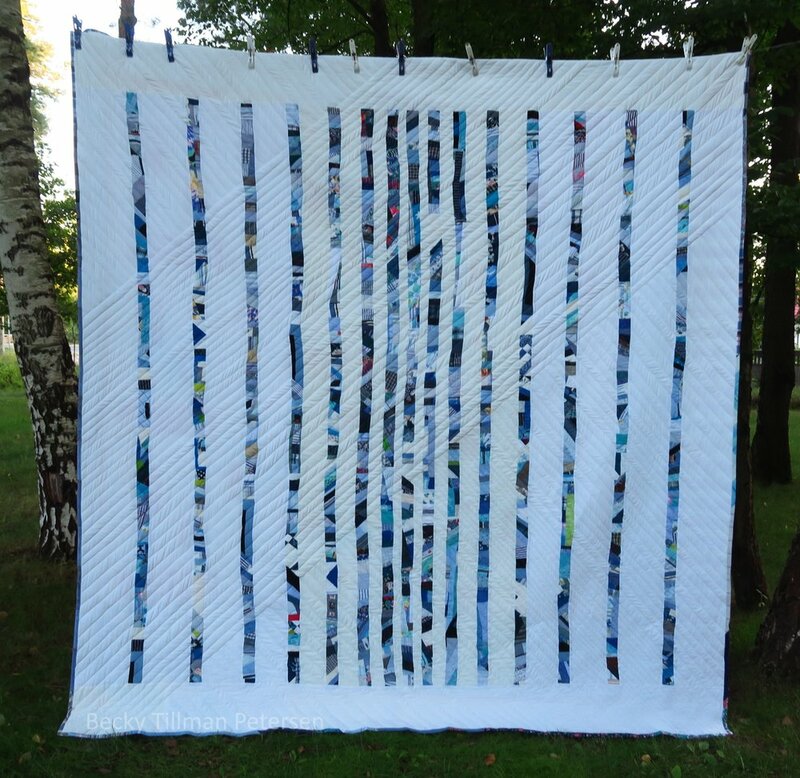 I have used this method for sewing on tape for all of these quilts. Don’t forget - be sure to check out what my sis has for you in the store! She is working hard to keep you in fabric at prices you can afford!